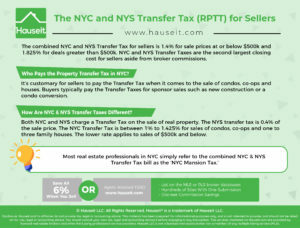 The combined NYC and NYS Transfer Tax for sellers is between 1.4% and 2.075% of the sale price. Buyers of residential properties priced at $1 million or more in NYC are also required to pay an additional NYS Transfer Tax called the Mansion Tax. The Mansion Tax is between 1% and 3.9% of the sale price, and there are 8 tax brackets which increase based on the sale price. The NYS Transfer Tax and Mansion Tax rates were amended in April 2019 as part of New York’s 2020 Budget. 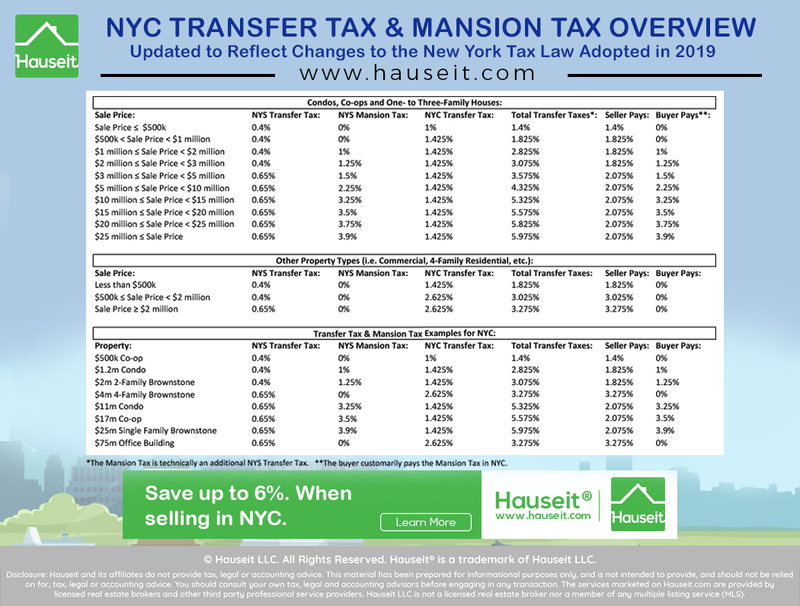 Estimate your Transfer Taxes in NYC with Hauseit’s Interactive Transfer Tax Calculator. The tax rates above apply to the sale of condos, co-ops and one- to three-family homes. Different RPTT rates apply for commercial deals and other property types, such as brownstones with 4 or more units. Since the Mansion Tax is customarily paid by the buyer, it’s typically excluded when talking about NYC and NYS Transfer Taxes since they’re paid by sellers. NYC and NYS Transfer Taxes are the second largest closing cost for sellers aside from broker commissions. According to the NYS Department of Taxation and Finance, sellers in NYC paid a total of $716,208,726 in NYS Transfer Taxes in fiscal year 2018. The NYC component of the RPTT (Real Property Transfer Tax) raised $1.775 billion for NYC in 2016 according to the NYC Office of Management and Budget. NYC’s RPTT (Real Property Transfer Tax) is authorized by the New York Tax Law Section 1201(b) and enacted by Title 11 (Chapter 21) of the New York City Administrative Code. The New York State Transfer Taxes (including the Mansion Tax) are authorized by New York Consolidated Laws, Tax Law – TAX § 1402. What is the NYC Real Property Transfer Tax? How Much Is the NYC Real Estate Transfer Tax? Who Pays the Property Transfer Tax in NYC? How Is the NYC Transfer Tax Calculated? How Are NYC & NYS Transfer Taxes Different? Are There Transfer Tax Exemptions in NYC? What Is the History of the NYC Real Property Transfer Tax? The NYC Real Property Transfer Tax is a seller closing cost of 1.4% to 2.075% which applies to the sale of real property valued above $25,000 in New York City. Although it’s commonly referred to by brokers, buyers and sellers simply as the ‘NYC Real Property Transfer Tax,’ this jargon technically includes two separate Transfer Taxes: a NYS Transfer Tax and a NYC Transfer Tax. The ‘Mansion Tax’ on sales above $1m is technically an extra Transfer Tax charged by New York State on sales of residential properties in cities having a population of 1 million or more. Since the only city in New York with a population above 1 million is NYC, the NYS Mansion Tax is essentially a NYC specific Transfer Tax which is collected by New York State. Because the Mansion Tax is customarily paid by sellers, it’s generally discussed separately from Transfer Taxes which are usually paid by sellers. 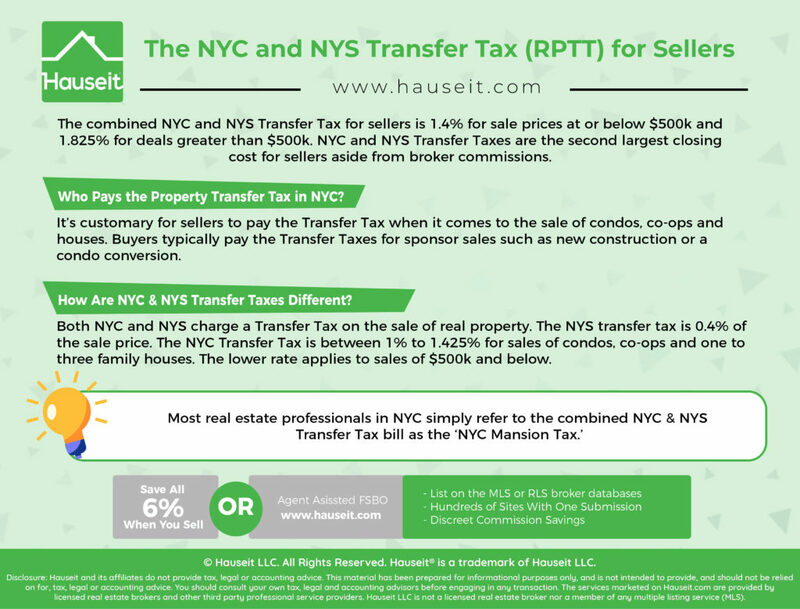 The ‘NYC Real Estate Transfer Tax’ generally refers to the combination of New York State and New York City transfer taxes payable by seller on a real estate transaction. The combined NYC & NYS Transfer Tax Rates are slightly higher for commercial transactions as well as for properties with 4 or more individual units. The RPTT also applies to the transfer or sale of 50% or more ownership in a partnership, corporation, trust or other business entity that owns and/or leases property. These sorts of transactions would also be covered by the higher Transfer Tax rates of 1.825% to 3.025%. If you’re buying a multifamily property with four or more units, you’d pay the higher commercial Transfer Tax rates of 1.825% to 3.075% as opposed to the residential rates of 1.4% to 2.075%. PRO TIP: 1% of the 2.625% RPTT tax levied on commercial deals above $500k is allocated to a special fund for the New York City Transit Authority (NYCTA), the City Paratransit system and the MTA. It’s customary for sellers to pay the RPTT (Real Property Transfer Tax) when it comes to the sale of condos, co-ops and houses. The most common exception to this is in the case of sponsor sales. A sponsor sale refers to the first time a property is sold from the original owner/developer to a buyer. Unlike for traditional private resales, the transfer tax is usually paid by buyers in the case of sponsor units. Furthermore, buyers also typically pay seller legal fees when buying a sponsor unit. However, this can be negotiable depending on how motivated the developer is to sell inventory. 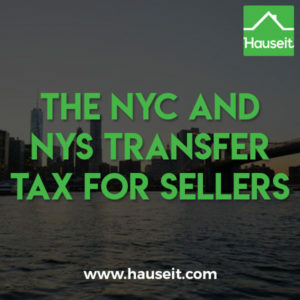 If the seller is exempt from RPTT or does not pay the tax, both NYC and NYS may seek to impose the unpaid transfer taxes as well as the NYC Mansion Tax on the buyer. In the example above, the buyer would also pay the Mansion Tax which is 1% for sale prices of $1 million or more and below $2 million. PRO TIP: The NYC Transfer Tax is the second largest NYC seller closing cost after the typical 6% commission bill paid by sellers. However, you should be aware that New York State also charges its own Transfer Tax of 0.4% in addition to the NYC Real Estate Transfer Tax. Both NYC and NYS charge a Transfer Tax on the sale of real property. The NYS transfer tax is between 0.4% and 0.65% of the sale price. The higher rate of 0.65% applies to residential sales of $3 million or more and commercial transactions priced at $2 million or more. NYS also charges an extra Transfer Tax called the ‘Mansion Tax’ for sales of $1 million or more. The Mansion Tax was previously a fixed rate of 1%, however it was amended in April 2019 to include 8 individual, progressive brackets. The highest Mansion Tax rate is currently 3.9% which applies to purchase prices of $25 million or more. The NYC Transfer Tax is between 1% to 1.425% for sales of condos, co-ops and one- to three-family houses. The lower rate applies to sales of $500k and below. NYC levies a higher Transfer Tax rate of 2.625% for sales of $500k or more. The commercial NYC Transfer Tax rate is 1.425% for sales of $500k or less. Although it’s not possible to avoid paying the NYC and NYS transfer taxes, you can reduce or fully eliminate the largest seller closing cost which is the traditional 6% NYC broker fee. Seller commissions in NYC have traditionally been non-negotiable, and virtually all sellers still agree to pay 6%. Selling FSBO in NYC is likely the first thing which comes to mind if you are thinking of ways to save money on broker commissions. Unfortunately, traditional FSBO does not work well in NYC since most buyers have agents who search for listings in RLS (which FSBO sellers can’t access). Hauseit’s NYC Flat Fee MLS (RLS) listing service uses the same listing syndication technology as traditional, full-service agents who charge 6% in commission. Your FSBO listing will receive the same marketing exposure as if you had hired and paid 6% to a traditional listing agent. Because your listing will appear just like every other traditional, RLS-listed property, you will be able to ‘co-broke’ more-effectively with the buyer’s agents who control 75% of the buyers in NYC. 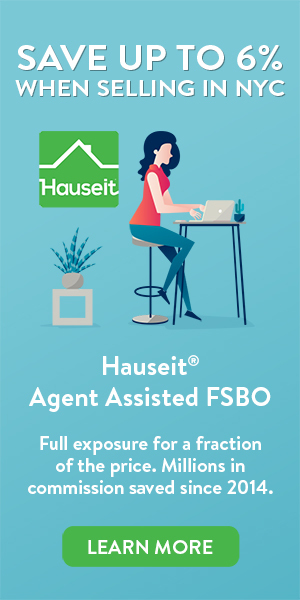 Hauseit’s listing service also helps reduce the traditional NYC FSBO broker harassment. Hauseit’s NYC Flat Fee MLS product lists your home on the RLS (REBNY Listing Service) broker database, StreetEasy, Zillow, Trulia, Brownstoner and many more for 0% seller’s broker commission. You can learn more about how to sell FSBO NYC by reading the extensive insight on our blog. Don’t have time to sell FSBO in NYC? Save thousands in commission by listing with a full-service, REBNY member listing agent in New York City for just 1% commission. Why should you have to pay 6% just because you don’t have the time or motivation to sell FSBO in NYC? Our 1% full service listing option is identical in every way to what you’d expect if you paid 6%. The 1% full service listing option may be a good fit if you fancy the idea of saving on commission but do not necessarily have the time, patience or energy to manage the entire sale process on your own. To learn more, request a free consultation. A deed or instrument given solely as collateral/security for a debt/loan. New York City has collected the RPTT (Real Property Transfer Tax) since 1959. The city raises approximately $1-2 billion annually from the transfer tax alone. According to the city’s tax revenue forecasting documentation, the RPTT accounted for 2.2% of the city’s overall tax revenue in 2012. 2019 – NYS updates the Mansion Tax to a progressive system with 8 individual tax brackets ranging from 1% on sales above $1m and below $2m and 3.9% on sales of $25 million or more. NYS also increases the NYS Transfer Tax from .04% to 0.65% on residential sales of $3 million or more and commercial sales of $2 million or more. Who Pays Property Transfer Tax in New York? How Much Is Transfer Tax in NY? When Is the NYC RPTT Payable? Who Pays Real Estate Transfer Tax in New York? Both the New York State and New York City property transfer taxes are typically paid by the seller. The exception would be in the case of buying new construction or buying a sponsor unit, whereby the buyer traditionally pays the transfer tax as well as the sponsor (seller) legal fees. A transfer tax is a seller closing cost levied on the transfer of real property in New York City. Both NYC and New York State charge separate transfer taxes on sellers. Transfer taxes are one of the largest closing costs for NYC sellers after the typical 6% NYC broker fee. The NY transfer tax is 0.4% of the sale price for most transactions, however it’s a higher 0.65% for residential sales of $3 million or more and commercial transactions of $2 million or more. NY also levies an additional Transfer Tax called the Mansion Tax on sales of $1 million or more. The NY transfer taxes are charged in addition to the separate NYC transfer tax. Transfer taxes are typically paid by the seller, however the NY Mansion Tax component of the NY Transfer Tax is traditionally paid by the buyer. The RPTT payable at the time the deed is registered with the City Register. If the transaction does not involve a deed, then the RPTT must be paid directly to the NYC Department of Finance (DOF). The taxpayer must file a return and pay the RPTT within 30 days after the date of the transfer. Both the New York State and NYC real estate transfer taxes are typically paid by the seller. The exception would be in the case of new construction or a sponsor sale, whereby the buyer traditionally pays the transfer tax as well as the sponsor (seller) legal fees. The mansion tax on sales above $1 million is usually paid by the buyer. NYC will by default charge sellers the higher transfer tax rates for non-residential properties if you sell two or more units within the same building within a 12 month period. This can impact many sellers of combined apartments who have not fully merged the apartments in the eyes of New York City. To fully combine two apartments, you will first of course need approval from your building’s board. Then you will need the NYC Department of Building’s approval. After the renovations are complete, you will need a Letter of Completion as well from them. If have condominium units, you will also need to amend the condo declaration in order to merge the tax lot. For condo owners, only after this step is done will they begin receiving a single property tax bill vs a property tax bill for each unit. If you haven’t merged the tax lot, our partner lawyers have had a 100% success rate so far in appealing a higher transfer tax rate. You will need a affidavit from an architect demonstrating that the combined units are truly one apartment. Pro Tip: You should avoid paying the sponsor’s transfer taxes when buying two or more new construction units. This is especially important if you buy one unit first, and then decide to purchase a second one some time later in the same building. Because of the 12 month look back described above, you may be retroactively hit by the higher transfer tax rate for non residential properties on both deals.